A few months ago I noted that easy going comfort is the main factor behind the decline of masculinity in the West and that only an atmosphere of conflict and hardship in childhood will strengthen Westerners to fight against the occupation of their lands. Hardship and healthy stress within a returning patriarchal family can produce the epigenetic effects on young boys necessary to engender the vitality and morale to reverse their extinction. But contrary to perceptions in the manosphere, toughness is only one side of a successful counter revolution. Whites will also need to drill into themselves and their children a nationalist version of the Protestant/Calvinist ethos that made possible the immense creative outburst of Europeans in the modern era leading to the acquisition of entire new continents. What could an ethos, a "calling" to engage in self-control and disciplined work as an end in itself, associated with the rise of capitalism, and explained in terms of the "inner loneliness" and "anxiety" produced upon believers by the Calvinist teaching of predestination, say about White survival? Weber's essay, The Protestant Ethic and the Spirit of Capitalism, published in 1904, is one the most debated essays in history. The consensus nowadays is that, however high the quality of this essay, the avalanche of writings against it, with Marxists playing a leading role, successfully invalidated its argument. I accepted this invalidation until very recently. 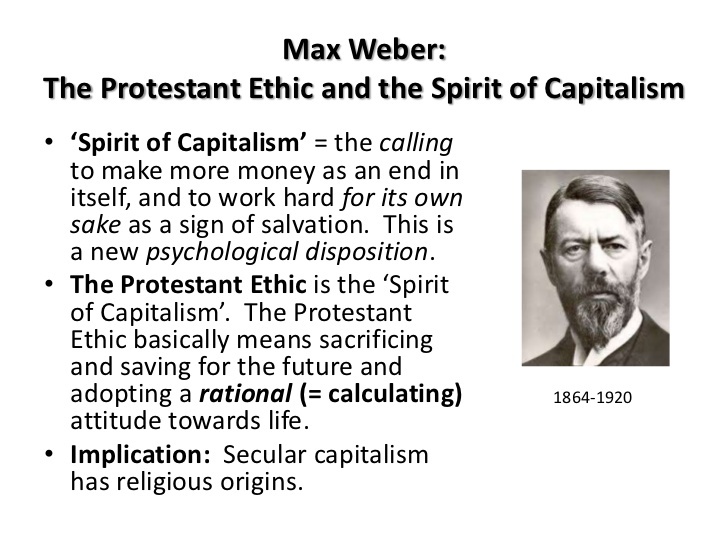 I can see now that the arguments against Weber applies primarily to the strictly religious aspects of his thesis. To what degree did he do justice to Catholicism? To what extent did the English Puritans believe in predestination? Did Calvinism really served to justify the accumulation of wealth and a behaviour defined as capitalist? 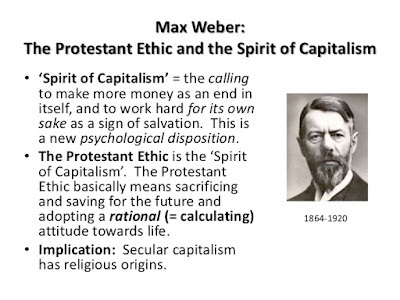 The importance of Weber's thesis goes well beyond his effort to connect the development of rational capitalism with the Calvinist doctrine of predestination. What makes his work a timeless classic, or what should make it so from an alt right perspective, is its observation that only Western men, among all religious believers in history, promoted a "this-worldly" religion, which introduced a drive to mastery in worldly affairs by means of a systematic ordering of every aspect of one's life starting with self-mastery over "everything impulsive and irrational, the passions and the subjective interests of the natural man." While Eastern religious men were contemplative in orientation, preoccupied with transcending worldly affairs, or reaching a harmonious coexistence with the world as it was, the Protestant sects of Calvinism, Methodism, Pietism, and Baptism called upon believers to gain mastery of this world through the "deliberate regulation of one's life," disciplined and methodical work, rather than to find salvation out of this world. Weber was right that the incredible success of Europeans in the modern era was made possible by a type of personality no longer interested in the unscrupulous pursuit of selfish interests, "undisciplined" acquisition of wealth, "without reserve and as an uncontrolled impulse." The aim of the Protestant way of life was to produce a new type of character able "to bring order into the conduct" of his life, "a cool self control and frugality," to achieve the highest return for each hour. It was only by making his Faustian restlessness "thoroughly rationalized," "emancipated from planless otherwordliness," freed "from the power of irrational impulses," that European men came to master the world in the nineteenth century as never before. The incredible success of Europeans brought them unparalleled affluence and easy comfort after WWII, coupled with the evaporation of any notion of a "calling." The capitalism of frugality and savings came to be replaced by a new form of Keynesian capitalism driven by effective demand, consumerism and welfare spending. It seems impossible now to resurrect the Calvinistic ethos Weber so admired. But if we can find a way to think of this ethos without the religious beliefs accompanying it, we may be able to extract some eternally valid precepts. One often hears in alt right circles exhortations about the primordial life-strengthening qualities of Europe's ancient pagan religions. But beyond historical curiosity and respect, the last thing we need is a return to the confused and dark, the mystical and ecstatic, uncontrolled and animistic atmosphere of paganism. We need the opposite. What made Calvinism absolutely different was its complete rationalization of the conduct of believers through the elimination of magic from the world as a means of salvation, which Catholics, and even Lutherans with their emotional piety, had not carried far enough. We need the elimination of "all the sensuous and emotional elements in culture and religion, because they are of no use toward salvation and promote sentimental illusion." "The undisciplined blustering" of alpha prelates will not secure White survival. The quiet self-control of the men who made Europe the technological dynamo of the nineteenth century is essential. Alt righters are also mistaken if they think that the way to defeat the social constructs of the establishment is for Whites to affirm their natural inclinations for racial identity and in-group behaviour. There are no societies without constructs, or norms to regulate human behaviour. The question is which culture has the best constructs to achieve mastery over nature. The science of racial differences is a form of mastery implying education and careful investigations that do not come naturally to societies but presuppose an entire regimen of discipline and knowledge. Overcoming the state of nature under a strict regimen of self-control, suppression of spontaneous emotions through disciplined rationalization of one's behaviour, are forms of habituation required in achieving mastery over worldly affairs. All the words cited above are from Weber's Protestant Ethic. Below I will present a quick sequence of additional passages and phrases from this essay with words added inside square brackets to make them speak to an alt right audience. The ability of mental concentration, as well as the absolutely essential feeling of obligation to one's job, are here most often combined with a strict economy which calculates the possibility of high earnings [highest returns for one's political activities] and a cool self-control and frugality which enormously increase performance. This provides the most favourable foundation for the conception of labour as an end in itself, as a calling which is necessary [to the preservation of Whites]. 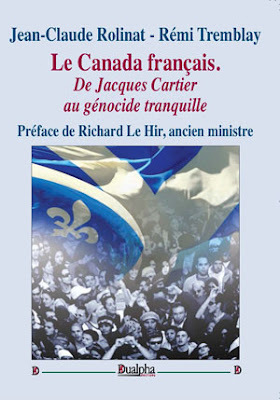 The question of the motive forces in the expansion of [White identity] is not in the first instance a question of the origin of capital sums...but, above all, of the development of...a rationalized spirit on the basis of the rigorous calculation, directed with foresight and caution toward the success [enhancement of Western culture]. They were [White] men who had grown up in the hard school of life, calculating and daring at the same time, above all temperate and reliable, shrewd and completely devoted to the [survival of Western civilization]. The ideal type [of the White leader] avoids ostentation and unnecessary expenditure, as well as conscious enjoyment of his power, and is embarrassed by the outward signs of the social recognition which he receives. His manner of life is...distinguished by a certain ascetic tendency...He gets nothing out of his wealth for himself, except...having done his job well. It is held to be an absolute duty to consider oneself chosen [to promote White identity], and to combat all doubts as temptations of the devil, since lack of self-confidence to reclaim their nation is the result of insufficient faith, hence imperfect grace. [The aim is to] develop a systematic method of rational conduct with the purpose of overcoming the state of nature, to free man from the power of irrational impulses and his dependence on the world of nature...The end of this asceticism [is] to be able to lead an alert, intelligent life: the most urgent task the destruction of spontaneous, impulsive enjoyment. The paths of worldly asceticism, which everywhere first seeks for tasks and then carries then out carefully and systematically. The idyllic state collapsed under the pressure of a bitter competitive [racial] struggle...The old leisurely and comfortable attitude toward life gave way to a hard frugality in which some...came to the top, because they did not wish to consume but to earn [for the White cause]. A specific type of conduct unmistakably different from the way of life of the natural man...an incentive methodically to supervise his own state of grace in his conduct, and thus to penetrate it with asceticism. The real moral objection is to relaxation in the security of possession, the enjoyment of wealth with the consequence of idleness and the temptations of the flesh, above all distractions from the pursuit of a righteous life. Waste of time is thus the first and in principle the deadliest of sins. The span of life is infinitely short and precious to make sure of one's own election [as a true White identitarian]. Loss of time through sociability, idle talk, luxury, even more sleep than is necessary for health...is worthy of absolute moral condemnation. How can contemporary men be motivated to organize their lives by an ethic that lacks any religious compulsions? Was not the doctrine of predestination, which says that only some humans are chosen to be saved from damnation, and which was the source of the anxiety that led believers to view worldly success as a "sign" of one's election for salvation, essential in sustaining the rationalization of one's life? 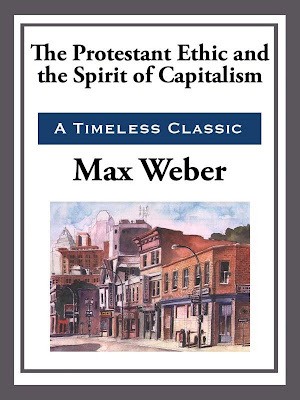 But it is also an essential observation of Weber that the spirit of modern capitalism in the twentieth century would continue to be characterized by a Puritan-like worldly asceticism "without the religious basis," by men who were no longer religious. 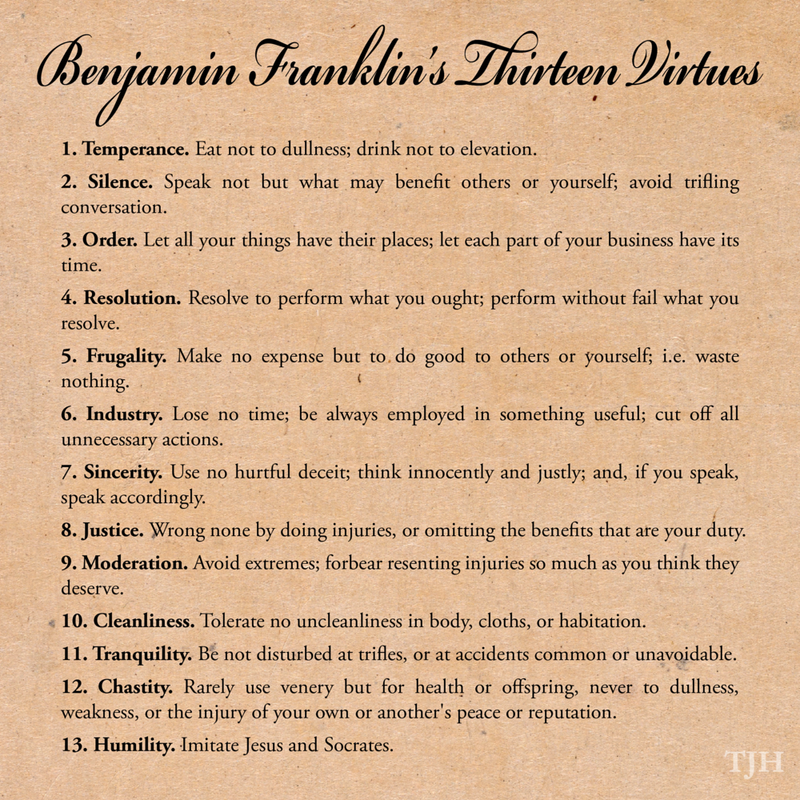 He goes back to the example of Benjamin Franklin's life, "a colourless deist," as the ideal-type, all-round highly successful individual, who meticulously organized his life to achieve the highest returns in utility according to his famous thirteen virtues. 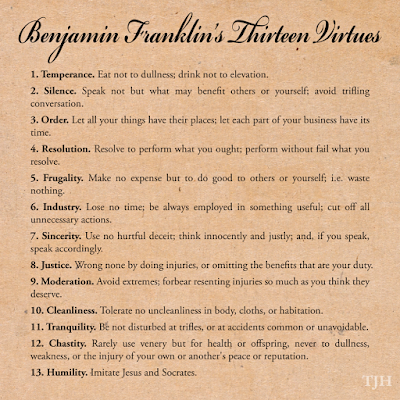 The virtues Franklin practised have an applicability among non-believers. The difficulty is whether White men today can live according to this very exacting mode of life. There is a world of difference between understanding an idea, agreeing with it, and having the epigenetic ability to organize one's life according to it. The way Weber framed his essay, as a "contribution to the understanding of the manner in which ideas become effective forces in history," does not help. It has been the way everyone has evaluated this debate, ideas versus "economic determinism." But the Protestant Ethic is not about ideas; it is about the way in which a substantially high number of Europeans decided to order every hour and day in their lives to perform tasks carefully and systematically without vacillation and uncertainty, without idleness and whimsical joys. One must be raised from childhood to behave this way, trained early on to suppress one's natural inclinations, by parents who themselves have lived according to this "idea," with the proper epigenetic changes in place to transmit to their children. Weber mentions how Franklin's "strict Calvinist father" "drummed into him again and again in his youth" religious precepts and utilitarian virtues. But just as important, as we read from Franklin's Autobiography, he began a life of continuous work at ten years old, starting in his father's shop, "employed in cutting wick for the candles, filling the molds for cast candles, attending the shop, going on errands, etc." This was just the beginning, but it was critically important in shaping his character for arduous tasks, in all spheres of life at a very high level. Can Western men, living in an age in which globalists want us to become mere pursuers of consumer comfort, regain again these virtues, or will we only see halfhearted counter measures against globalism, sporadic outbursts, irrational acts of violence, lots of idleness and complaints, few methodical, systematically ordered lives dedicated to European nationalism as if it were a calling to ensure God's grace and salvation?